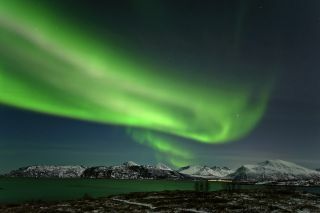 Skywatcher Robert Korizek took this photo of an aurora over Tromso, Norway in March 2012. Outbursts from the sun over the past week are now paying dividends to skywatchers, who have been treated to amazing views of auroras recently. The glowing auroras, also called the northern and southern lights, are caused when charged particles from the sun collide with Earth's magnetic field. These charged particles are in abundance lately in the wake of a series of super-charged solar eruptions that began on Tuesday (March 6). The sun released two huge X-class solar flares on Tuesday, followed by strong eruptions on Wednesday and Thursday. These tempests have fired off waves of plasma and particles called coronal mass ejections that travel through space, sometimes hitting Earth and giving skywatchers a treat. Astrophotographers Imelda Joson and Edwin Aguirre were flying from from Boston to Los Angeles Thursday night (March 8), and knew the chances of seeing auroras were high. "At the gate we asked the airline agent to switch our seats to the right side of the plane so our cabin window would be facing north," Joson wrote in an email. "We first noticed the aurora's greenish glow along the horizon as the plane was approaching Wisconsin. The glow grew stronger and stronger, and by the time we were flying over Minnesota, the display reached its peak, exhibiting distinct structures such as bright rays, curtains and bands." Skywatchers Imelda B. Joson and Edwin L. Aguirre spotted the aurora on March 8, 2012, while travelling on a commercial flight. They write: "We were on our way from Boston to Los Angeles at the time ... somewhere over Minnesota." The two photographers managed to snap a number of great aurora shots, and even spread their enthusiasm to other passengers. "We told a number of passengers as well as flight attendants about the aurora and they soon joined us in taking turns peering through the plane's small windows," Joson wrote. "Around this time, the captain also noticed the show outside and made an announcement over the P.A. system to alert the rest of the passengers and crew." Observer Shawn Malone caught a view of the northern lights over Lake Superior from Marquette, Mich., early Wednesday (March 7). Skywatcher Shawn Malone took this photo March 8, 2012. She writes: "Caught a nice outburst of northern lights last night ... aurora over Lake Superior, Marquette, MI taken early this morning." "There will probably be some major activity in coming days — I'm definitely not used to the frequency of this activity!" Malone wrote in an email to SPACE.com. "Before 2010, I went 3+ years of not seeing the lights. This pick-up in activity is welcome indeed." If you catch views of the auroras that you'd like to share with SPACE.com for a possible story or image gallery, please contact assistant managing editor Clara Moskowitz at cmoskowitz-at-space-dot-com. You can follow SPACE.com assistant managing editor Clara Moskowitz on Twitter @ClaraMoskowitz. Follow SPACE.com for the latest in space science and exploration news on Twitter @Spacedotcomand on Facebook.